We know that there are holiday-obsessed gals out that impatiently wait for this time of the year. You can finally involve all the cheesy holiday motifs in every segment of your life without being judged. It’s so easy to get trapped in the holiday spirit and get obsessed. Everything from the workplace, the stores to the city is full of Christmas and New Year’s decorations. So, is kind of hard to resist the Holiday season craziness. To add up on that get your nails done in a similar aesthetic. You can do something subtle that doesn’t necessarily scream “HO HO HO it’s that time of the year!” Glitter nail designs are perfect if you want something not that obvious, but still glamorous. 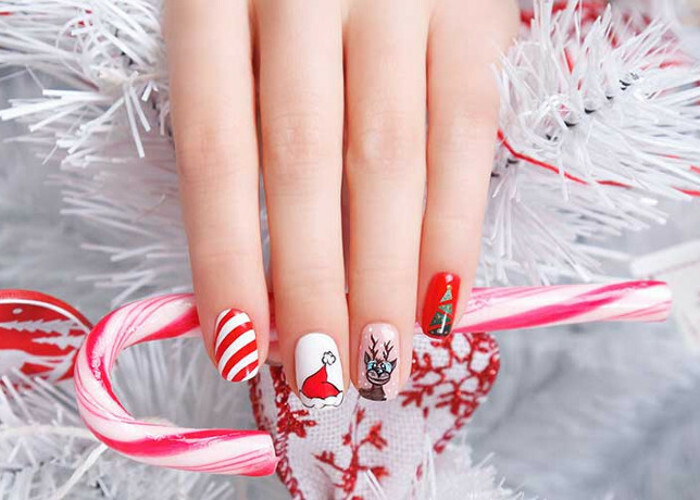 Even red and white nail design will let everyone know that you are in the holiday mood. Or you can go the extra mile and celebrate your holiday obsession through your nails in the most obvious way. Electric nail designs with Santa Claus, Santa’s helpers, Christmas trees, Christmas tree decorations and more aren’t just for kids. You are allowed to flaunt these nail designs during the holiday season even if you are a grown woman. Fun graphic nail designs that feature holiday motifs are something that everyone around you will love. Even your 5-year old niece will be impressed by your nails. If you want something unique, opt for holiday details that aren’t very popular. Take the Christmas lights nail design for example. You can use small decorative stones to create this nail design. For a bolder effect use stones in different colors. If you have time for experimenting, you can use the stones to create different shapes that imitate holiday motifs. The snow is another signature element of the winter holidays.You can flaunt nails with snowflakes to pay tribute to the all-white idyllic situation during the holiday season. Metallic deep blue and icy-silver combo looks amazing especially if you add glitter and snowflake graphics. For the ultimate holiday-inspired nails mix common holiday motifs with glitter. You are allowed to be over-the-top at this time of the year, so there is no reason to hesitate. It’s already December, so hurry up and schedule an appointment to get your nails done or stock up on fun nail products to experiment at home. Here are some of the possible ideas you could do to your nails during this holiday season.